The happiest event in the north opens its doors again at the North Peace Cultural Centre at 6:00. Tickets will be sold at the NPCC box office. For the price of a ticket, $20 per adult, $10 per child or $45 for a family of four, patrons have the opportunity for unlimited tasting of many deliciously decadent chocolate confections donated by home and commercial bakers. A live auction for the beautiful baked goods begins around 6:45 and while enjoying the tasting treats, bids may be placed at the silent auction table. There is something for everyone at this amazing event. 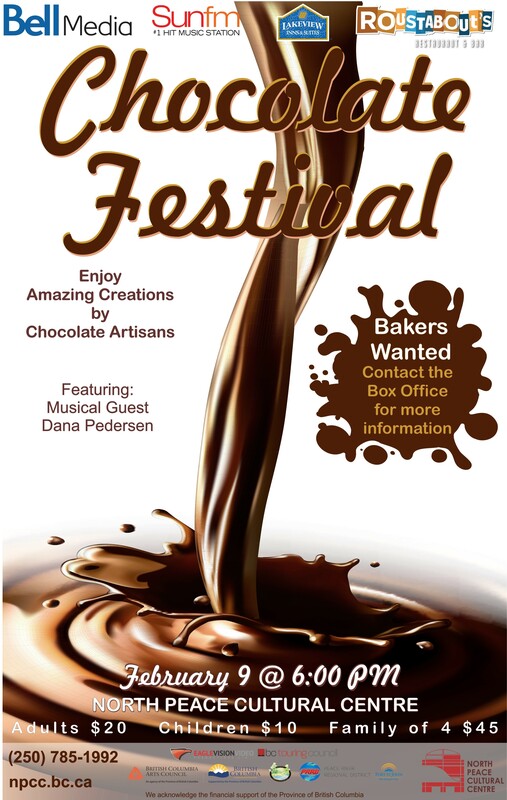 Proceeds from the Chocolate Festival go to supporting children’s art programming in the form of the Let’s Art free art program, and other arts programming at the North Peace Cultural Centre. To enter, bakers are asked to contribute two identical items, i.e. two batches of fudge or selections in one of the other five categories. One will be wrapped in clear cellophane by volunteers and displayed beautifully for the Live Auction and the other will be cut up (by volunteers) into tiny “tasters” for the judges and patrons of the event. In accordance with food safe regulations, nothing that requires refrigeration can be accepted. Winners of each category (Cookies, Candy (Boutique), Squares, Cakes, Kid’s, and Commercial) will receive a blue ribbon, recognition at the event, in the media and on the North Peace Cultural Centre website as well as free admittance to next year’s event. Bakers are asked to confirm their participation with a call to North Peace Cultural Centre, (250) 785-1992, before January 25th. Delivery of baked donations will take place at the NPCC foyer on Saturday, February 9th between 10:00 a.m. and 1:00 p.m. At time of drop-off, please indicate whether your recipe contains nuts. We are looking for volunteers to help at the North Peace Cultural Centre on the day of the Festival with the cutting up of tasters and the receiving of donations. If you can help on this busy day, please let us know. Proceeds from the Chocolate Festival supports Arts programming at the North Peace Cultural Centre, including Playarts Preschool, Let’s Art free art class, and more.